Planning a visit to the Cologne Christmas market? You have the choice of seven different markets to explore in Cologne (Köln). That's worth the journey, so why don't see them all? Köln is one of the oldest cities in Germany. The city on the Rhine attracts millions of visitors each year. 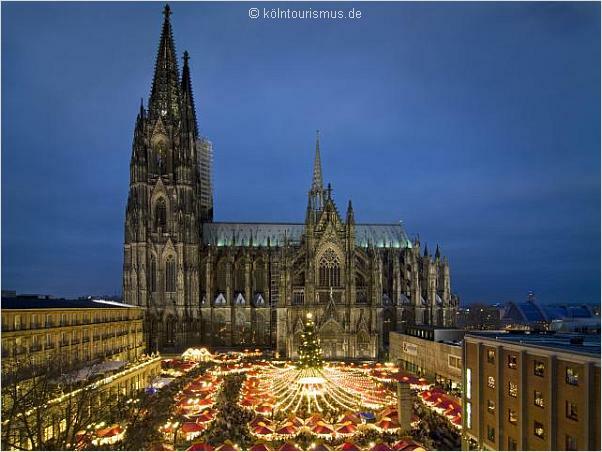 Cologne is worth a visit anytime, however, during the Christmas season it is truly special. International travellers rate German Christmas markets among the best in Europe. The Cologne Christmas market at the cathedral is one of the favourites of visitors from Belgium, the Netherlands and Great Britain. 27th of November is the start of this years markets around the city. Weihnachtsmarkt at Roncalliplatz in front of the cathedral is the Cologne Christmas market par excellence. 160 beautifully decorated stalls, the majestic cathedral as a backdrop, the tallest Christmas tree in the Rhineland, these are the superlatives of Cologne's most imposing Weihnachtsmarkt. Cribs and a merry-go-round are attractions for the youngest visitors. 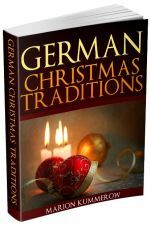 An extraordinary variety of crafts makes it easy to find a special Xmas gift. 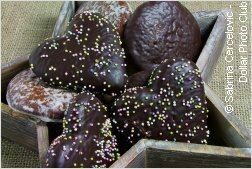 Only 200 m from the cathedral and the central station, this market in the heart of the old town is home to Cologne's famous Heinzelmächen (see box below). They watch the goings-on, and take care that newfangled gadgets don't disturb the traditional Christmas preparations. The market in the winding lanes of the old town has the most rustic and idyllic atmosphere, it is a favourite amongst Cologne's citizens. Open daily 11am to 10pm late November until 23rd December. This is Cologne's oldest Christmas market, however, new organisers turned the appearance of the market in 2008. Walk through the angel's door, become enchanted by the beautifully decorated stalls and the delightful Christmas atmosphere. Open daily 11am to 9pm (until 10pm on Fridays and Saturdays) from late November until 23rd December. Weihnachtsmarkt on Rudolfplatz - The Fairy Tale market Set against the historic backdrop of the mediaeval Hahnentorburg, this Cologne Christmas market fascinates children with large fairy tale figues on the roofs of the stalls. 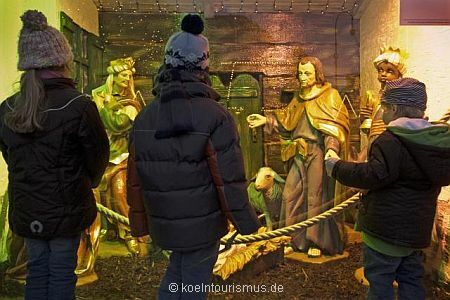 A hand-carved crib and a huge adventscalendar are other attractions, apart from the good food, arts & crafts and daily visits of St. Nikolaus. The little house gnomes (Heinzelmännchen) are said to have done all the work of the citizens of Cologne during the night, so that the inhabitants of Cologne could be very lazy during the day. According to the legend, this went on until a tailor's wife got so curious to see the gnomes that she scattered peas onto the floor of the workshop to make the gnomes slip and fall. The gnomes, being infuriated, disappeared and never returned. From that time on, the citizens of Cologne had to do all their work by themselves. This legend was first written down by the Cologne teacher Ernst Weyden (1805-1869) in 1826. It was translated into English by Thomas Keightley and published 1828 in his book "The Fairy Mythology". Köln offers even more Xmas markets for your excitement. Medieval artisans who demonstrate their crafts dressed in traditioanl clothing give this market a very special and traditional appearance. 30 fascinating stands, medieval music, and no electric light. At night the place is lit by flaming torches. Have you ever visited a Floating Christmas market? It is held on board of the MS Wappen of Mainz. Sit down and sip a Glühwein, and enjoy the view to the cathedral and Cologne's old town. 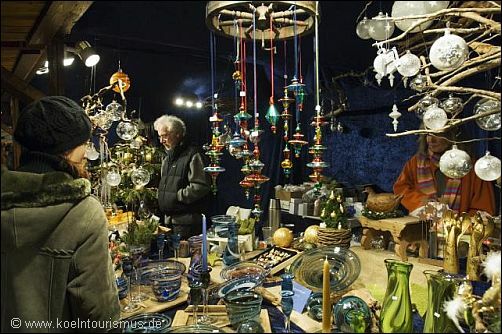 Stadtgarten Christmas market is Köln's youngest Xmas market with a relaxed atmosphere. Whichever market you choose to visit, it will be an unique and fascinating experience. 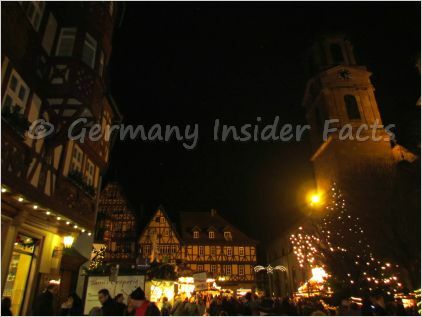 Once you are there, I know you wish to see more than just one Weihnachtsmarkt. Relax and board a ship to enjoy the magnificient scenery along the the river. Afternoon and dinner cruise are especially delightful during Advent. Don't know where to stay in Cologne while you enjoy the Christmas markets? Use the search box and compare the best deals.